Different kinds of insects have different ranges. For instance, Africanized honey bees, or killer bees, only inhabit Southwestern states and Florida, and they become more numerous in the Central American nations to their south. Fire ants, on the other hand, are a growing problem throughout the Southern states and even into Maryland. Bees and ants are pest creatures throughout the United States, but because of these ranges, not every state has to worry about them for the same reasons. However, mold is a different story. Mold is an older, simpler kind of life form, and it’s a lot more tenacious than an insect. They can grow so long as there’s any moisture at all and a good surface to live on, and if there’s extra moisture to go around, they can thrive. Mold is the reason why you need to clean your bathroom regularly, but not every part of your house or apartment complex is as easy to reach as your bathroom. That’s why AA Action Waterproofing offers mold remediation in Bel Air, Maryland, and in the rest of the nearby area. The term “remediation” may not be as simple as “removal” or “extermination,” but it is the most accurate term. To “remediate” means “to return to average,” and as far as mold goes that’s the best you can hope for. Mold spores are everywhere, at all times, and each one can last for years, waiting for just enough moisture in the air to germinate and grow. They don’t need much food, either, and different species can live on things like wood, cloth, and even dust and shed skin. As such, just about every building that’s more than a few months old will have mold growing somewhere inside it. All a company like AA Action Waterproofing can do is clean up the visible growths, find ways to reduce moisture so that mold can’t thrive, and thus bring the spore count down to acceptable levels. 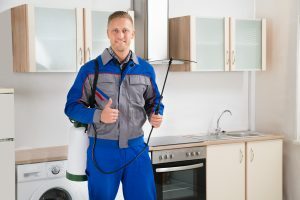 Since mold is already everywhere and you aren’t currently hacking up a lung, you may be wondering why you should have to pay for mold remediation in Bel Air or wherever you may live. The answer is that while many mold species are harmless to humans, some of them are toxic. Black mold species, which are named for the color they tend to appear as, produce a toxin which can affect the respiratory systems in humans and many other animals. Symptoms include a runny nose, coughing, sneezing, nausea, and headaches. In other words, depending on the infestation level and the strength of your immune system, the effects of toxic mold spores can seem like anything from an annoying cold to a bad flu. If you’re having trouble telling whether it’s black mold or a persistent infection, the key difference is that mold symptoms will fade while you’re away from your home. And while mold infestations are rarely life threatening, they can make your life miserable if you don’t deal with them. Why Call In The Experts For Mold Remediation Bel Air? If you clean your Bel Air basement or crawlspace on a regular basis, if you don’t experience any black mold symptoms, and if you’re keeping moisture levels down by fixing leaky pipes quickly and using a dehumidifier when it gets humid, then you probably won’t need any expert help. However, if mold seems to come back all too soon after you wipe it away, or if someone in your home is really suffering from a mold allergy and you can’t find the source, it’s time for a professional mold remediation Bel Air. AA Action Waterproofing is your best bet for mold remediation in Bel Air, Fallston, the Baltimore-D.C. Metro Area, and beyond. Any mold you see on the surface may be nothing more than a sign of a much deeper infestation, and our experts can find where it’s hiding, remove as much of it as possible, replace or block off the rest, and also find out what moisture problems may be causing the mold. With as humid as Maryland gets in the spring and summer, the problem may be as simple as trapping humid air in the basement and the solution as easy as buying a dehumidifier. So if you suspect you have a mold problem, contact us today to arrange for a free written estimate for mold remediation in Bel Air, Maryland.